Blackpool are set to name former England captain Paul Ince as their new manager on Monday, caretaker boss Steve Thompson has confirmed. 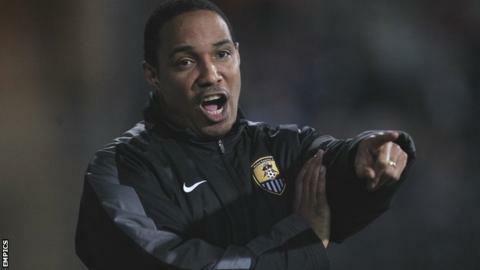 Ince, 45, who has been without a job since leaving Notts County in April 2011, will become the club's third permanent manager of the season. "The deal is very close to being done." Ince will link up with his son, 21-year-old winger Tom, who has scored 17 goals in 33 appearances this season. The Seasiders are 14th in the Championship, 10 points from a play-off spot and six above the relegation zone. Ian Holloway and Michael Appleton had spells in charge earlier this season, while Thompson has been in temporary control for the past month. Ince's appointment will end a managerial exile of almost two years. After a playing career including two Premier League titles, two FA Cups and 53 England caps, Ince moved into management with Macclesfield Town in 2006. Despite being bottom of the Football League when he took over, he helped the club avoid relegation on the final day of the 2006-07 campaign. His success with the Silkmen saw him move to MK Dons, with whom he won the League Two title and the Football League Trophy. With his stock rising, Ince was announced as manager of Premier League side Blackburn in 2008, but was dismissed from the Ewood Park post having won just three of his first 17 league games.